This article is about the mountain on the Isle of Man. For the Icelandic volcanoes of the same name, see Snæfell. It is a well-known saying in the Isle of Man that on a clear day six kingdoms can be seen from the top: the Isle of Man, England, Ireland, Scotland, Wales and Heaven. Some versions add a seventh kingdom, that of Manannán (or the sea). The Snaefell Mountain Railway has a seasonal electric tram service, typically from April to October, which climbs the 4 miles (6.4 km) from Laxey to the summit. 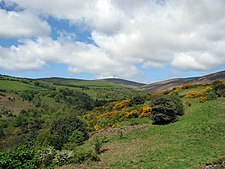 The A18 Snaefell Mountain Road passes over the slopes of Snaefell, and is the highest section of the Snaefell Mountain Course over which the Isle of Man TT Races are held. Walkers often use the car park on this road near the Bungalow railway station (last railway stop before the summit) from which there is a rough path to the peak. The trail has sections of gravel, slate stones, grass and rock. While the angle of ascent steepens significantly closer to the summit, special climbing equipment is not required. However, caution is required in steep areas as the grass, earth and rocks are often slippery. Average climb time on foot on a dry footpath is about 45 minutes. A geodetic marker embedded in the small, concrete obelisk indicates the true mountain summit. The rock cairn standing nearby has an information plaque on top. In 1970, the automated weather station at the Snaefell summit recorded a gust of 150 mph which was one of the highest wind speeds ever recorded in the British Isles. During hurricane storm force winds, the 120 foot tall Civil Aviation Authority radio mast at the Snaefell summit was damaged and blown down on 2 December 1966. ^ Place Names of The Isle of Man – Da Ny Manninee Dooie Volume Three. Sheading of Ayre (Kirk Andreas, Kirk Bride and Kirk Christ Lezayre) page 464 Kirk Christ Lezayre by George Broderick – Tübingen; Niemeyer NE:HST (1997) Manx Place- Name Survey, Max Niemeyer Verlag Tubingen ISBN 3-484-40138-9 (Gesamtwerk) 3-484-40131-1 (Band 3) Druck: Weihert-Druck GmbH Darmstadt Einband: Siegfried Geiger, Ammerbuch. "A mountain summit ct. SC38NE SC39788811"
^ "Ordnance Survey Triangulation stations trig archive". Retrieved 17 October 2016. ^ "Ordnance Survey mapping". Retrieved 17 October 2016.